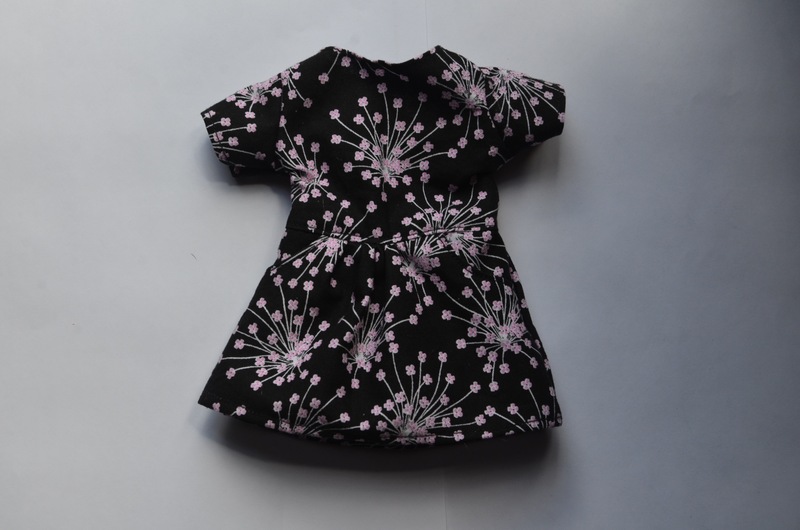 Keep your Hearts for Hearts Girls® or Les Cheries® doll looking cool and casual with the Drop Waist Pocket Tee Dress PDF Doll Clothes Pattern from 123 Mulberry Street! This pattern is designed to be sewn with knit or woven fabrics. PixieFaire and the designers featured are not affiliated with Hearts for Hearts Girls® or Les Cheries®. This pattern is really cute. I was interested to see that this pattern use knit or woven material. I choses a printed woven and I was able to get one dress from a fat quarter. I made this dress for my niece's Wellie Wisher. I don't have a Wellie Wisher on which to try the dresses, as my niece lives across half way across the country, so I rely on the patterns to be accurate. I had two slight issues with this pattern. First, the pocket facings didn't line up correctly. I was able to make it work, though. Next time I will wait to cut those pieces until I have the skirt sewn together. Second, the fit was reported as a bit tight. I don't know if this is because I used a woven material (no stretch), if this is an issue with the pattern, or if it had to do with snap placement, which were right on the edge. It still fits, my niece said it's just tight to snap. I know this shows a hook and loop closure, but the snaps are a smaller width and were placed on the edge of the back opening. I haven't had this issue on other patterns, so I am pretty sure it's not a sewing issue. I do plan to use this pattern again with pocket facing modifications and maybe adding 1/8" to the side seams, for woven fabric. This was one of my nieces favorite pieces I sent (out of 7) and she thought the functioning pockets were really cool. Also, for all the details on this dress, it went together very quickly. I also followed the extended back opening for WW dolls. Loved this pattern, and recently tried it for the new 14.5" AG WellieWishers, too. Fit perfectly--but I lengthened the back opening to a full 4" to allow easy dressing over the WW arms. With the great directions and clear pictures, this is a really nice knit fabric project. It'll be very versatile for our Wellie girls! This is such a cute dress and fits both dolls perfectly. I have made two so far and plan to make more. This dress went together in half an hour and is very cute. Fits perfectly.